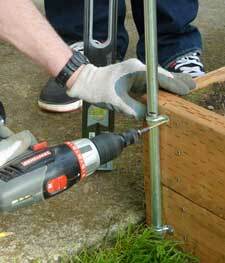 You can buy a tomato trellis kit or build your own. Either way growing tomatoes on a tomato trellis is a very good method of supporting tomato vines. Just picture a wall of green in your garden laden with edible vegetables ripe for picking! They can also be used as a summertime privacy fence. 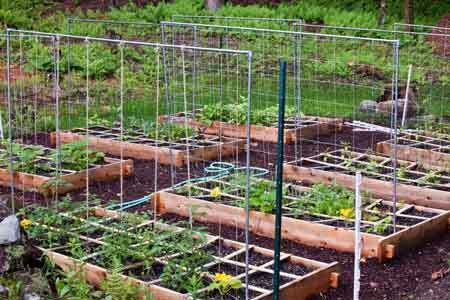 Of course, these structures aren't limited for use with tomatoes, and are also known as a vegetable trellis. Frees garden space -- unsupported tomato vines need 15 sq. ft.
Mel Bartholomew's book Square Foot Gardening has popularized a DIY vegetable trellis made from electrical conduit and nylon trellis netting for supporting tomato vines. Another trellis material that works great is Gardener's Supply's Nearly Invisible Netting made of translucent polypropylene with six-inch squares that is extremely strong. In fact, these vegetable trellises will even support large fruits including cantaloupes and melons! Tomatoes can also be supported without the netting by hanging twine from the horizontal supports, anchoring the lower end, and periodically twisting around the vine. 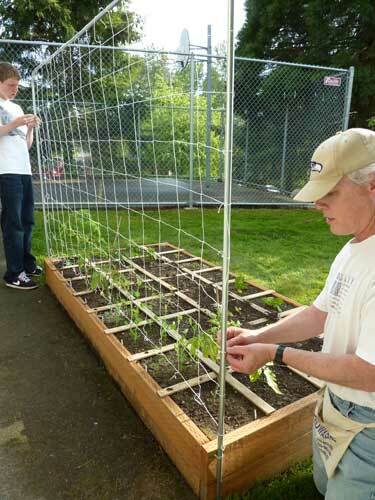 Tomato trellises can be made from other materials as well. Using the trellis netting only requires a rigid frame that can be made from steel pipe, wood, PVC or other materials. An alternative to the trellis netting is to use ordinary wood trellis used around the yard or other types of fencing material. It isn't quite as good as the trellis netting in terms of cost and convenience but might have some aesthetic advantages. There are two ways to make the conduit frame. Either buy two 90-degree joints for the corners or use a conduit bender. If you don't already have a bender it will cost you about 30 dollars or so; you may also be able to rent one. I preferred the rounded-corner-look so went for the bender. 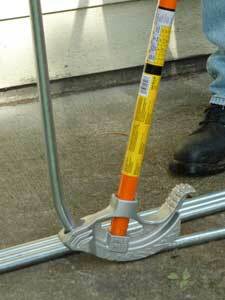 After measuring for length and optionally bending the corners, cut the conduit pieces using a tube cutter. The pictured frame is 5-1/2 ft. tall and 8 ft. wide. Once the conduit is cut to length, connect all the pieces together using the set-screw conduit joint connectors. If you plan to make three or more of the trellis frames it becomes cheaper to bend the corners to eliminate the need for the joint connectors. When it comes to setting the trellis frame in place you have two options--secure pipe straps onto the raised bed, or set over two pieces of one-half-inch rebar 3-ft. long hammered into the ground. I tried both methods for two trellises and found that both methods felt secure. 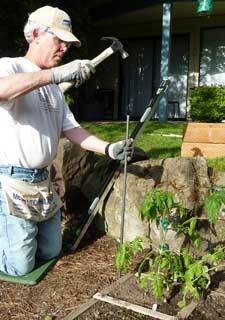 To attach the trellis netting to your frame, cut the netting leaving a loose tying end. Loop the loose end over the conduit and tie a simple knot like a half-hitch, giving a slight tug to make sure it won't come loose. You can also buy commercial trellis kits at your garden center or online like the Vegetable Trellis, 62" H sold by Gardener's Supply to make your work easier. All use variations of the basic idea--a frame to weave tomato vines through. Some use twine or ropes for support, and others use plastic coated fencing or powder-coated steel that can be self-supporting without a frame. Any of these types should work--the stronger frames will simply last for more seasons. Another nice aspect of the tomato trellis is that one structure can support more than one tomato plant. I've used a hanging twine trellis to support my tomato plants the last few years but this year I'm switching my vertical supports to trellis netting for even more convenience.